All KING WILLIAM homes currently listed for sale in San Antonio as of 04/24/2019 are shown below. You can change the search criteria at any time by pressing the 'Change Search' button below. "This majestic, yet wonderfully urban King William home rich in history sits on a perfect corner lot. This architectural gem has been meticulously maintained w/high ceilings, original wood floors, ornate mouldings throughout, abundant built-ins, & expert lighting Carved marble mantle in bathroom and a balcony with grand views. Gourmet Kitchen with gas cooktop and with an additional study room that can be transformed into guest/ exercise room. Off-street parking with room for garage. 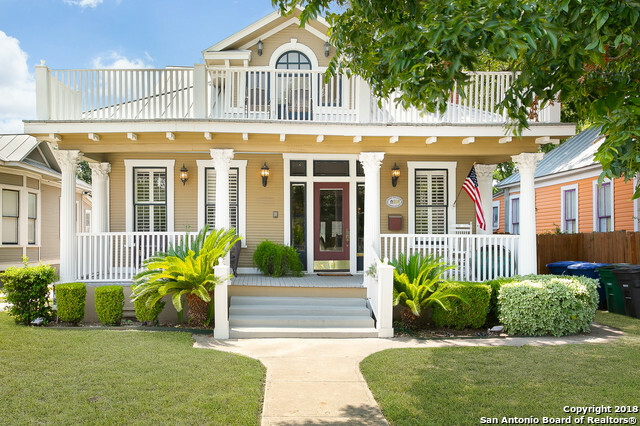 Walk to the P"
"*REDUCED $10,000* Beautiful historic home located in the Sought After King William District with views of the Towers of America from your Master Suite Balcony. Minutes away from the River Walk with Bike Trails, Local Resturants and Entertainment. 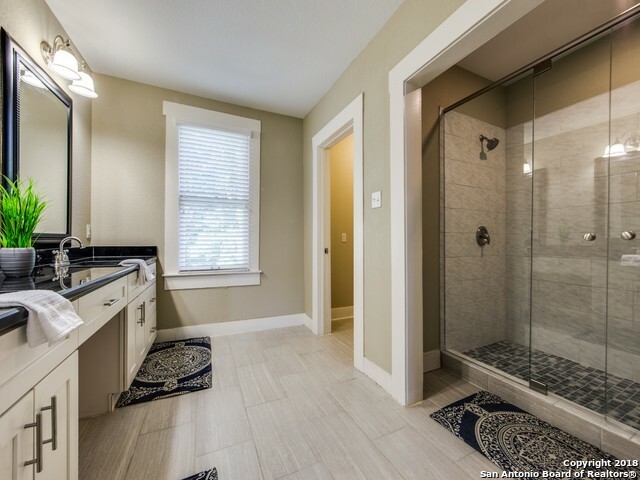 You will absolutley love the Huge Frameless Glass Shower in Master suite! NEW Rooof 11/2018, Refinished wood floors, new blinds, stained deck/balcony, all exterior white paint, just to name a few recent improvements." 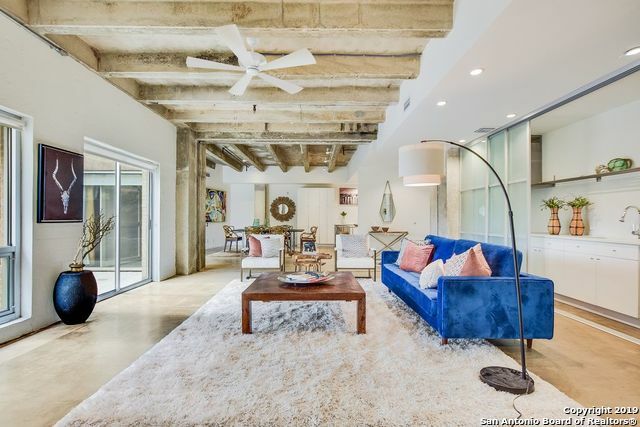 "Gorgeous condo in historic King William featuring the combination of 2 units creating an open floor plan and high ceilings, along with large, beautiful windows allowing abundant natural light. Open concept kitchen has updated appliances, the secondary kitchen has additional storage. Fully-equipped fitness center & pool on-site included in ownership. 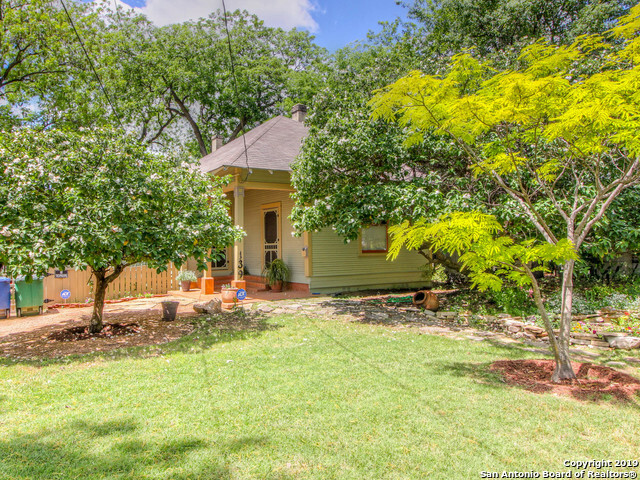 Prime Southtown location next to Liberty Bar & one block from River Walk. 2 parking spots available." "Nestled in the historic King William Neighborhood, Cedar Street Townhomes offer exceptional urban living in the heart of San Antonio. Each of these 14 townhome residences feature modern, craftsman design, enclosed garages, and balconies with scenic views. You'll be steps away from downtown San Antonio, the exceptional restaurants, shops and art galleries of Southtown, and the Mission Reach of the River Walk. Under construction for completion February of 2019. Non-condo, fee-simple townhomes. Low"
"King William Folk Victorian built in 1892 & part oflabor de abajoor lower farmland. *Early history in Assoc. Docs* Quiet residential community 1/2 blk from the River Walk access-Across river@BlueStar, short walk to trendy eateries, museums,grocery, public schools. One owner 40 years- Elec.,plumb.,foundation work in past 15yrs. Owned solar plan, new carport,Addtl. structures incl.shed, wrkshp, office & apartment- all structurally sound w/new red cedar deck. Original features preserved and well car"
"Premier location in the heart of King William Historical District.This stunning property was completely renovated in 2015 while restoring the timeless original features; including the old growth pine hardwoods, transoms and windows.Enjoy the expansive front porch,high ceilings,french doors,abundance of natural light,+ more.Located steps from the San Antonio River, Blue Star Arts Complex, and South Alamo shops and eateries.Electrical, plumbing,appliances,foundation work,HVAC replaced in 2015.No C"
"AS CUTE AND CHARMING AS IT LOOKS***WHITE PICKET FENCE ENTRY AND A WELCOMING COVERED PORCH***FEATURES 2 BEDROOMS AND 2 BATHS WITH A BONUS ROOM THAT COULD BE STUDY, ANOTHER BEDROOM.....MAKE IT YOUR OWN***HOME INCLUDES AN UNBELIEVABLE WORKSHOP, A STORAGE SHED WITH CABINETS, A SECOND COVERED PATIO, OUTDOOR LIVING......SO MUCH MORE***SECONDARY BEDROOM HAS BUILT-INS AND A FIREPLACE***CUTE UPDATED EAT-IN KITCHEN WITH CUSTOM STORAGE AND GAS COOKING***MANY LARGE WINDOWS TO ENJOY MATURE TREES**TAKE A LOOK"
"*Historical King William District*Quaint covered front porch, features 2 bedroom, 2.5 bathrooms & over-sized detached garage w/attic. Recent paint, , stained glass transom over entry, refinished hardwood floors, high ceilings, french doors & crown molding. Study/2nd Bedroom. Huge gourmet island kitchen w/commercial grade SS appliances, gas cooking & custom cabinetry. Custom bead board ceiling treatment in kitchen & dining. Restful master retreat w/full bath. Mature tree"
"Great Live/Work studio in King William with large picture window to allow natural light overlooking 300 sqft fenced patio. 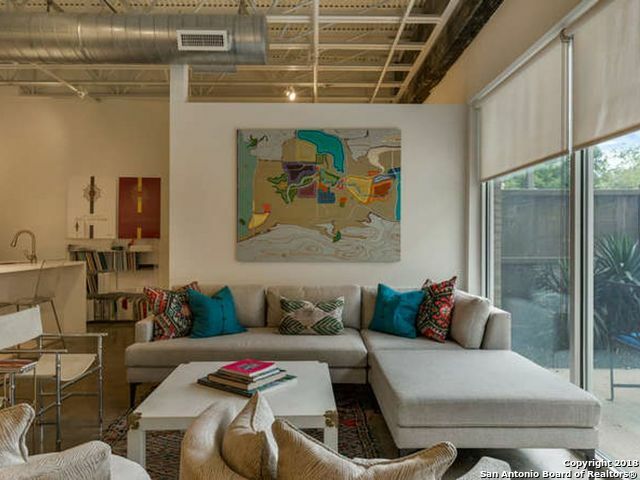 This fabulous condo has soaring ceilings, concrete floors, and large kitchen island. The complex has a 24/7 fitness center and pool. This unit is located close to Liberty Bar and has small signage available with one covered parking. 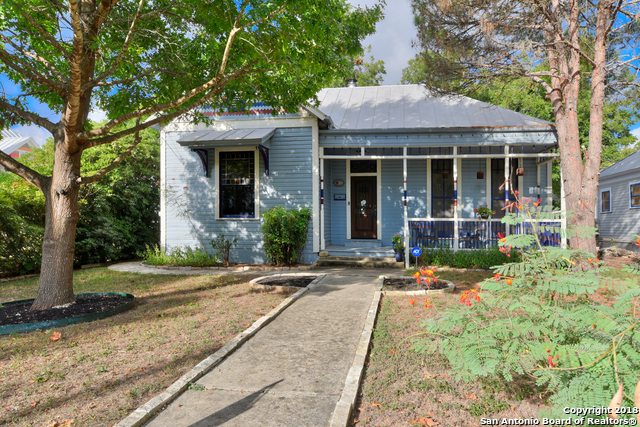 Close to the San Antonio River, Blue Star and fine dining. Come see this cool spot!"